Ropey Jungle is a level consisting of many ropes and vines in Wario Land: Shake It! and is located in Jiggle Jungle. As the level's name says, Ropey Jungle has many ropes and vines in which the player can climb on to get over rivers and obstacles around the jungle. 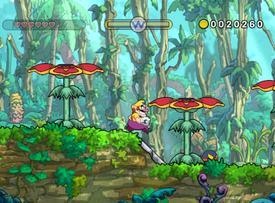 Another part of the level is around many Venus Guytraps that can trap Wario if he stands on them too long. Fortunately, Wario can jump on them to reach higher areas and get treasure. Later in the level, the player will come up to even more ropes to climb on, including ones that Wario can slide place-to-place on. In this area, there will also be purple Venus Guytraps that can catch Wario much faster than the normal red ones. The player can also use these to reach higher ledges and get to the caged Merfle. When freeing the Merfle, an alarm will go off and Wario will need to run to the end of the level before the clock hits zero. This page was last edited on January 16, 2019, at 11:01.